Unknown Device in Device Manager – Causes and Solutions? Unknown Device in Device Manager is one of the problems that a PC user might encounter regarding hardware devices; it is usually indicated by a warning symbol or a sign such as an exclamation or question mark. This article will tackle the most common causes of why Unknown Device Errors in Device Manager occur and possible solutions, both manual and instant – which will save you lots of time and energy. Missing device driver(s): Most hardware devices function correctly without additional device drivers because of the built-in drivers incorporated in the Operating System of a computer. Still, in some cases, an additional device driver will be required if the hardware device does not suit the required and supplied Windows class drivers. Absence of the required driver results in a device being accounted as Unknown Device in Device Manager. Unrecognized Device ID: Each hardware device has a particular identifier used by your computer to verify hardware devices; this identifier includes IDs such as Vendor ID, Device ID, Subsystem ID, and other IDs. If your computer does not recognize several or any of these IDs, Device Manager accounts your device as unknown. Faulty or Defective Hardware: A hardware device might sometimes work improperly, failing to be recognized by your computer. This scenario might also be true with defective devices which might work for a couple of times but will not work for your next utilization, thus being displayed as an Unknown Device in Device Manager. Reinstalling Device Driver: This is the first step in trying to manually fix Unknown Device Problem in Device Manager. Right-Click on the Unknown Device, and then Click on “Properties”. If under the General tab you see a message that says something like what you see below, then Click on “Reinstall Driver” button. Your Windows OS may be able to automatically locate the needed driver or drivers, or you may be prompted to insert the installation CD, or if the unknown device is an external device you may have the CD that came with it. If not, there are more options to consider! Searching Online: To be able to search online for a device driver, you must gather important details regarding the problematic device. Follow these steps: Right-Click on the problematic device > click Properties > Details tab. In this example, you will notice VEN_1106 and DEV_3059, which stand for Vendor ID = 1106 and Device ID = 3059.These are the important details you will need in order to search online and download device drivers. 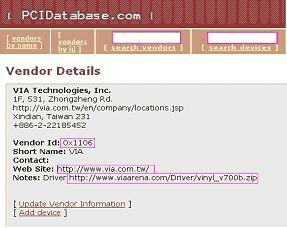 One helpful website that may provide important information about your hardware device is PCIdatabase.com. PCIdatabase will let you search using either the Vendor ID for Vendor Search or Device ID for Device Search, and it should output the vendor and device details. Our example gives the following results, and from here you will be provided with the manufacturers’ website for you to visit, search, and download your device driver. Manually fixing Unknown Device in Device Manager often takes plenty of your time and energy. It requires basic computer troubleshooting, including specifying the reason for Unknown Device Problem in Device Manager, checking if it is only a faulty hardware device, reinstalling, and testing if you have already fixed it by trial and error method. You might also be exposed to great risks while searching and downloading device drivers online. Some of these risks are downloading the wrong device driver, outdated/corrupted device drivers, device drivers bundled with viruses, spyware, and adware. Offers fast, effective and accurate computer driver verification, and instantly detects missing and defective drivers. Very easy to use which saves time and energy. There will be no need for manual troubleshooting because Driver Detective will automate all the process of searching, updating and fixing your device drivers. Product of DriversHQ (Certified Microsoft Partner), a trustworthy and reliable company which provides dependable products to the customers. Driver Detective is a great deal for solving Unknown Device in Device Manager and it also offers a free scan on your computer for you to experience and realize several of its advantages and benefits. So download Driver Detective, a driver update software compatible with Windows 7, Windows Vista, Windows XP, 2000, 2003 Server, 2008 Server, and 2008 R2 Server.